All of our laboratories share our heavy-duty construction techniques and 'traditional' standards of finish. We offer a choice of specialised worktop materials such as Texwood, Iroko, Trespa and Corian surfaces. We produce a wide range of double and single base units; drawer packs; tray units; fume cupboards; plan chests and tall storage units. All can be finished in a choice of colours. We also supply units finished in real beech, ash, or oak veneers, sealed with long-lasting lacquers. All units incorporate the highest quality gas fittings, electrical trunking, and plumbing. Curriculum, teaching style, and space restrictions dominate the choice of design for a science lab, food science, wood-work, textiles or art room. 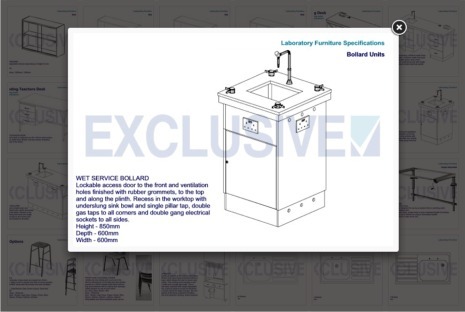 Planning a refurbishment of an existing room, or new laboratory, requires careful thought and attention with regards to teaching style, access, servicing and flexibility. We can provide a no obligation room design service to transform your ideal concept into a safe, practical teaching environment. Despite our high quality levels, we are able to offer highly competitive price levels for both standard and bespoke furniture and fitments. All share our heavy-duty construction techniques and “traditional” standards of finish. We are able to provide a real choice in space planning, work surface specifications and colour combinations. We can tailor a complete design solution to meet your needs. "We proceeded with Exclusive partly on the basis of cost, but also because we felt we could work with them. The plans they came up with showed us that they had really listened to what we wanted to achieve. We had to work through some cost reductions to make it fit our budget and received good advice about how best to do this with minimal compromise on look and durability... It was a complicated project in a tight timescale but it all went very smoothly and everything was ready for the start of the new term. Any minor snagging that was discovered once we started using the rooms was promptly addressed, without any fuss. We found Exclusive to be innovative, reliable and value for money. We would definitely approach them again when we are doing our next major refurbishment project."